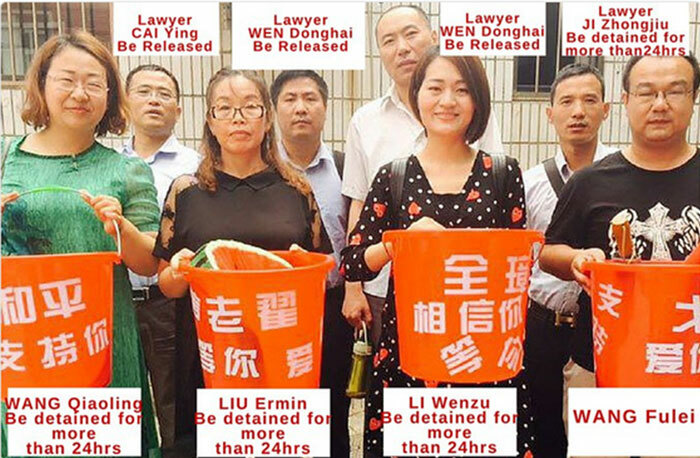 A screen shot from the China Human Rights Lawyers Concern Group's Facebook page showing detained family members and attorneys, June 7, 2016. Rights activists and lawyers have hit out at new regulations brought in by the ruling Chinese Communist Party placing further restrictions on lawyers' ability to protest abuses of judicial power. An amended set of the Ministry of Justice's "Administrative Measures for Law Firms" will place lawyers who speak out about rights abuses within the judicial system at risk of losing their livelihoods, especially in "sensitive" political cases. The new rules, which take effect Nov. 1, effectively ban lawyers from speaking to the media or walking out of court in response to torture, forced confessions or other violations of their clients' rights. "These measures are ... a stern warning to law firms to keep their lawyers in line or face penalties," the overseas-based Chinese Human Rights Defenders (CHRD) network, which collates and translates reports from Chinese rights groups, said in a statement on its website. "[They will] further restrict lawyers from exercising their professional duties in defending clients’ rights involved in high-risk political cases," the group said. Under the new rules, lawyers will be banned from putting pressure on the authorities by speaking out in public, and from "slandering" judicial and law enforcement agencies. Petitions and signature campaigns, open letters, gathering online in chat groups, or expressing solidarity with parties involved in their cases will also be penalized. Any lawyers engaging in "putting out distorted or misleading information and commentary" could also face sanctions for "malicious speculation" on cases. Refusing to take part in court proceedings without reasonable grounds, or leaving the courtroom without permission could both bear consequences for lawyers. Instead, law firms in China must be ruled by the Communist Party and toe the party line in public, the new rules state. The amended rules come after more than a year of detentions and other restrictions imposed by police on China's human rights lawyers, starting with the detention of Beijing Fengrui law firm employees in July 2015. Henan-based rights lawyer Ma Lianshun said the rules are the next move in a concerted clampdown on rights lawyers under President Xi Jinping. "They are exerting pressure on lawyers via the law firms, but it will have a negative impact on the ability of rights lawyers to protect their clients," Ma said. "The rights that should be enjoyed by Chinese citizens will also be affected," he said. Ma said he has already seen a change in the types of cases that law firms are willing to accept in the current political climate. "My previous law firm ... got very frightened by some of the cases I was taking, and told me to move to a different law firm, which I had to do in the end," he said. Beijing-based rights lawyer Chen Jiangang said the new rules are totally unreasonable. "When it comes to protecting lawyers' rights and those of others, all we have is the law," Chen said. "But in today's China, the law is being used as a tool for oppression of lawyers, and of ordinary citizens." Fellow rights attorney Cheng Hai said the new rules prevent lawyers from speaking out. "Now, it's no longer possible to guarantee a client's right to a legal defense," Cheng said, citing the refusal by authorities to allow rights lawyers detained since July 2015 to meet with their own lawyers while in detention. "They use all manner of excuses to deny these meetings," he said. "They also refuse to give us access to the results of the investigation [into the alleged crime]." "Lawyers should be able to act as supervisors, to stop the authorities acting illegally and correcting any mistakes made, so there are fewer miscarriages of justice," he said. Reported by Xin Lin for RFA's Mandarin Service, and by Wong Lok-to for the Cantonese Service. Translated and written in English by Luisetta Mudie. Who says the Communist Party is not corrupt? Absolute power, corrupt absolutely!